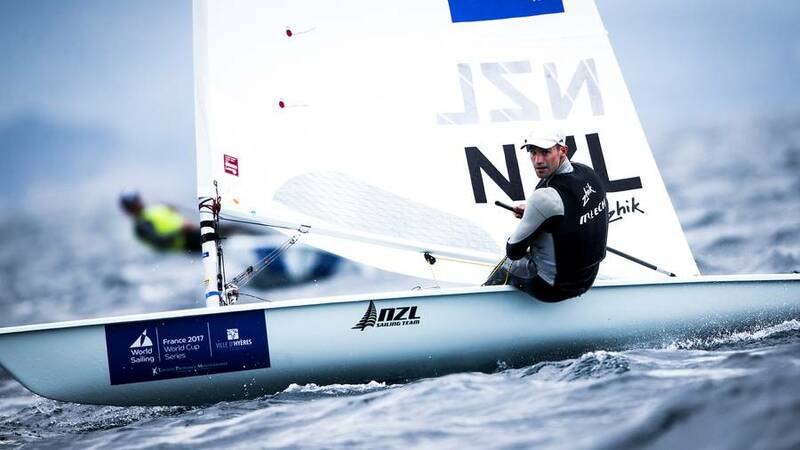 Sam Meech banked three seconds at the Laser world championships in Croatia overnight (NZ time). Photo: Sailing Energy / World Sailing. There were plenty of sore bodies after racing overnight (NZ time) at the Laser world championships in Croatia and there was also a fair degree of satisfaction as well as disappointment among the Kiwi contingent. Sam Meech continued his good form, collecting three second-placed finishes in the strong winds to sit in fourth, only two points behind Cypriot Pavlos Kontides, and he was joined in the top 10 by Tom Saunders, who is seventh after banking a second, fourth and third in his three races. Andrew McKenzie thought he had moved up considerably into 17th after three solid races only to be slapped with a disqualification after a protest. It meant the 46th he scored in the opening race of the regatta needed to count – all sailors discard their worst score in qualifying – and he slipped well down the leaderboard. Meech and Saunders comfortably qualified for gold fleet, which is made up of the top third of the field of 147 sailors, although it wasn’t always comfortable on the race track off the coast of Split. Winds of 20-25 knots battered the sailors overnight and many were showing the after effects of a hard day on the water. “Everyone is looking like they can hardly walk now,” Meech said. “It looks like we will have some good breeze again tomorrow so I’m going to be super tired after tomorrow’s racing. It’s certainly tight among the contenders after qualifying and most of the big names are hovering. Only 16 points separate the top 10 and, ominously, the Australians are well poised with Matthew Wearn moving up into third and Olympic champion Tom Burton sixth after two wins overnight. Meech has been a model of consistency, finishing second in his last four races, although he had to play catch-up in the opening race overnight. “It was super hard out there today,” he said. “It was really, really hard on the body but I’m pretty stoked to come away with three seconds. “In the first race I had a really good start but went the wrong way and was quite far back in the pack at the first mark but I had a really god run and then managed to get a couple of boats before the finish so that was really good. Survival was the main priority for some in the fleet and gear damage was common. Kontides failed to finish the last race when his sail ripped and local favourite and Rio silver medallist Tonci Stipanovic limped home with a tear in his sail. “It doesn’t get any tougher than that, sailing in the upper wind limits and with massive waves,” Saunders said. “It was a case of getting off the line and sending it. George Gautrey joined McKenzie in silver fleet after qualifying in 57th.